White tundra and small hills and mountains as long as you can see. The spring sun has just gone up over the horizon and begins to color the landscape in warm tones and a scent of fresh coffee is spreading inside the cozy cabin. A new day dawns and together with our sled dogs, we are on the journey through one of Sweden’s most powerful high mountain areas. We work our way into the Laplandic mountains through mountain valleys and across open plateaus. On this tour all nights are spent in mountain cabins. The route goes north from Saltoluokta Mountain Station along the famous Kings Trail. We then take a detour in towards the Norwegian border and finish with Stora Sjöfallets National Park before we return to the starting point of our adventure. The exact route may differ from the planned because we try our best to not disturb the reindeer herders and their reindeer’s in their work and we try to avoid bad weather as much as possible. We meet at dinnertime at Saltoluokta Mountain Station. The dinner is usually at 18:00. If you arrive earlier in the day you will have the possibility to borrow snowshoes from us if you like to go for a shorter hike in the area. If you prefer skiing you can rent skiis from Saltoluokta. Enjoy a sauna or just curl up by the cozy fireplace in the entrance. The Saltoluokta restaurant usually serves food out of the ordinary. A combination of local food, traditional cuisine inspired by the modern new ideas. Breakfast at Saltoluokta Mountain Station. We load the sleds and you get a lesson in how to handle a dog sled, how to break, harness the dogs and how to steer. Then make us ready to start. When the dog teams are ready we lift our snow ancers and stear our teams west along the Great Lule river valley. We pass by Stora Sjöfallet and go north towards the Teusajaure cabin where we plan to arrive during the afternoon. At Teusajaure cabin offers a sauna and for those who want it is possible to get a soothing sauna before dinner. Our journey goes further west along the Teusadalen. This valley is famous for its rich population of moose in winter. From Teusajaure we leave the marked trail and find our way along a small river, Suorggejohka. This stretch can offer both surprisingly bad snow conditions, but also offer fantastic conditions with opportunities for wildlife-watching. The landscape changes is character from a narrow valley with birch forest up to the treeless open expanses. The Sitasjaurecabin is the goal for today. The trail north from Sitasjaure leads us over open mountain plains. Today we won’t see any trees. Everything is open, vast and desolate. During the day, we will come very close to our neighboring country in the west, Norway. The Hukejaure cabin which is our goal for the day lies in a landscape resembling of the moon. Here we stay overnight and hopefully we will not feel the strong wind from the Atlantic as at times pushes up from the west and shake the cabin. We leave the Hukejaure cabin and steer our dog teams east towards the mountains of Kebnekaise. During the day, the landscape character again and from the open wide spaces we travel into deep valleys, surrounded of high mountains and if the weather is good we will spot Kebnekaise, Swedish highest mountain top. Today we have several options for where we can stay overnight. The Sälka cabin, Kebnekaise mountain lodge, the Singi cabin och maybe Kaitumjaure. We let weather, wind, the dogs and the group’s daily shape determine the exact route. During the day we will return to Teusajaure cabin where we have already stayed once. We follow Kungsleden south and from the treeless valley the journey goes down and we pass areas of the small grown mountain birc. At the Teusajaure cabin we can again enjoy the wood heated sauna. Today we steer our dog teams east along the lakes towards Stora Sjöfallet and further along down to Saltoluokta Mountain Lodge. This day we go the same route as we did our first day of mushing. 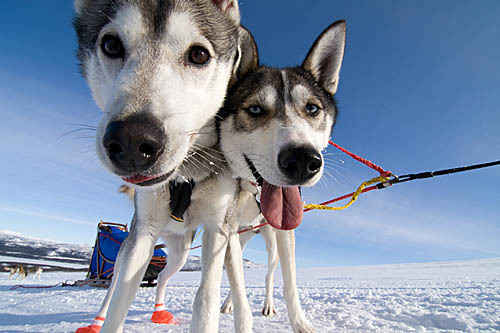 The difference is that now the traveling by dogsled has become a part of your life. You are more relaxed on the sled and you are able to enjoy the view more than you did the first day. At Saltoluokta Mountain Station sauna, a shower and a delicious three course dinner awaits us. Breakfast at Saltoluokta Mountain Station. The snow mobile transfer over the lake to the bus usually leaves after lunch so if you like you can borrow our snowshoes and go for a stroll in the area. All activities are mostly moderate but sometimes hard. In wilderness cabin we sleep on bunk beds in mixed room with both gentlemen’s and women’s. The wilderness cabins are heated with wood/gas and have no electricity or running water. Dry toilet is available by the cabins. You also need to have in mind that you will be physically active outside in the cold for many hours each day. Our tours are not made up touristic adventures but real experiences where everybody work as a team and helps with everything from taking care of the dogs, cooking, loading the sleds, fetching water and setting up tents (when on a trip including camping) etc.